Black Friday shoppers pepper-sprayed in Calif.
PORTER RANCH, Calif. - Twenty people, including children, were injured when a woman at a San Fernando Valley Walmart store used mace against other customers in what authorities referred to as a "competitive shopping" incident. The Los Angeles Times reports that a scuffle broke out shortly before 10 p.m. Thursday night, just before shopping was to begin, among customers waiting to buy Xbox gaming consoles and Wii video games. Alejandra Seminario, told the Times she was waiting in line to buy toys about 9:55 p.m. when there was a commotion in the next aisle when shoppers began tearing off plastic encasing gaming consoles. "People started screaming, pulling and pushing each other, and then the whole area filled up with pepper spray," she said. Seminario breathed some in and started coughing. "I did not want to get involved. I was too scared. I just stayed in the toy aisle," she said. below: CBS Station KCBS' report includes video taken at the scene of the pepper-spray attack. Juan Castro, who was at the scene and took cell phone video of the aftermath, told KCBS correspondent Suraya Fadel, "Just as they started to unwrap everything, all hell broke loose and everybody just swarmed. And in the middle of the parade, some lady just started (pepper spraying) the crowd," he said. "There were two ladies on the side of me that started fighting." Castro said customers were "just trampling over people, people shoving each other. ... There were a lot people who got it in their eyes, so they were burning. They were screaming, crying. It was bad." Wes Elder of the Los Angeles County Fire Department told Reuters that a patron inside the store had deployed pepper spray. "It resulted in 20 patients total that had just a brief exposure to the pepper spray." Cesar Seminario, who got to the cash register 20 minutes later with a Wii gaming console and some Barbie dolls, told the Times the air was still smelling of pepper spray. "After we paid, we saw five [people] that were in really bad shape," she said. "They had been sprayed in the face, it looked like, and they had swelling of the face, really extreme swelling of face, redness, coughing." 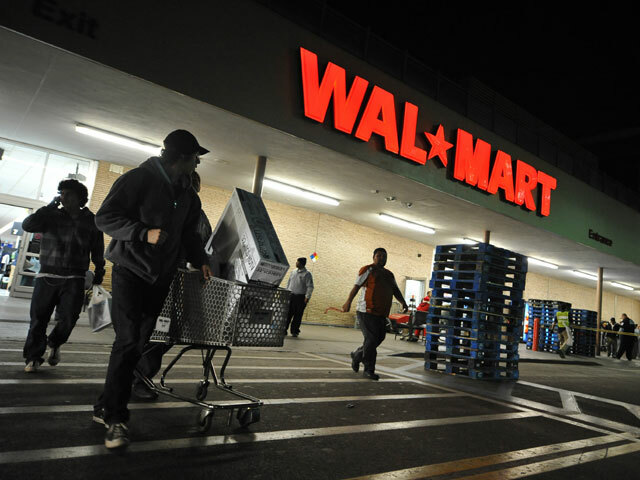 Wal-Mart employees took statements from customers who had been pepper-sprayed, Seminario said. KCBS reports police are examining video taken at the scene to identify the woman who used the pepper spray. When told later of what happened, Nakeasha Contreras, who arrived at midnight, said she wouldn't have been bothered: "I don't care. I'm still getting my TV," she told the Times. "I've never seen Wal-Mart so crazy, but I guess it could have been worse." Joseph Poulose was hit with the pepper spray near the DVD and video games display. He clamed Wamart for failing in crowd control: "There were way too many people in a building that size. Every aisle was full," he told the Times. .